The following paper explores the Inconspicuous Head-Mounted Display within the context of a live technology-mediated music performance. 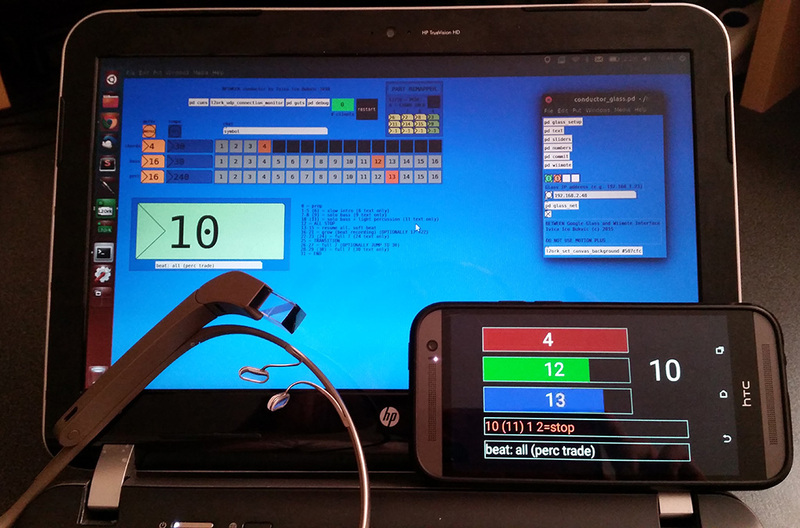 For this purpose in 2014 the authors have developed Glasstra, an Android/Google Glass networked display designed to project real-time orchestra status to the conductor, with the primary goal of minimizing the on-stage technology footprint and with it audience’s potential distraction with technology. In preparation for its deployment in a real-world performance setting the team conducted a user study aimed to define relevant constraints of the Google Glass display. Based on the observed data, a conductor part from an existing laptop orchestra piece was retrofitted, thereby replacing the laptop with a Google Glass running Glasstra and a similarly inconspicuous forearm-mounted Wiimote controller. Below we present findings from the user study that have informed the design of the visual display, as well as multi-perspective observations from a series of real-world performances, including the designer, user, and the audience. We use findings to offer a new hypothesis, an inverse uncanny valley or what we refer to as uncanny mountain pertaining to audience’s potential distraction with the technology within the context of a live technology-mediated music performance as a function of minimizing on-stage technological footprint.